This elegant smoked salmon rice salad with arugula and cherry tomatoes will impress your guests and satisfy their craving for fresh summer fare. 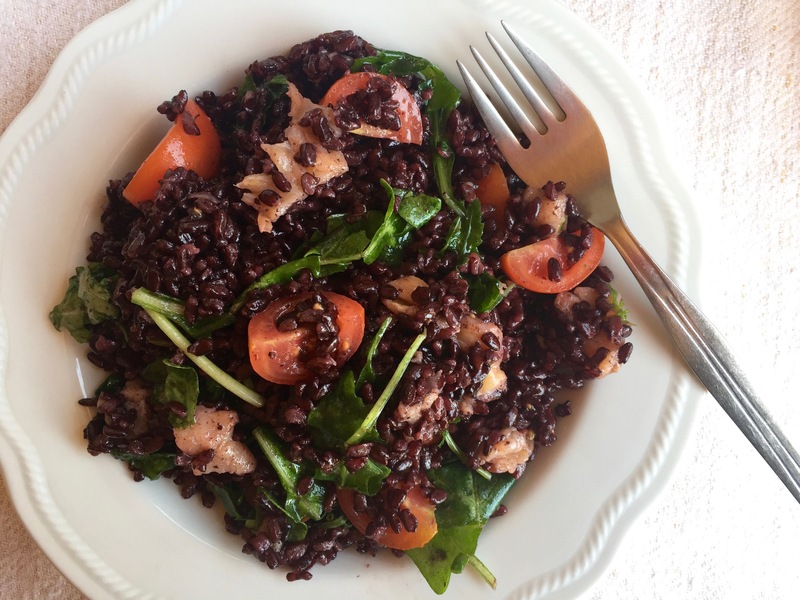 ‘Forbidden’ black rice is combined with salty smoked salmon, bitter arugula, and sweet cherry tomatoes and tossed in a light vinaigrette made with olive oil and lemon juice. Prepare this unique palate-pleaser for your next dinner party. The summer heat is still going strong here in Sardinia. In fact, this week has been one of the hottest since we arrived in early July. At any given point of the day – that is, if we’re not frolicking in the Mediterranean sea, we are searching for refuge from the heat; ice water, which is a rare find in Italy, since according to an old wive’s tale, can cause ‘blocco di stomaco’, (which could apparently kill you), air conditioner set to max, and super fresh meals, mainly salads prepared with fresh veggies from our garden. Albeit I love a fresh summer salad, I’m a grain kind of gal, and often incorporate grains into my summer salads. I love a hearty grain like quinoa or rice since they’re very versatile and can be served hot or cold. As of late Ive been preparing mostly cold rice salad recipes, like Sweet Pea Prosciutto Rice Salad, Italian Rice Salad, and this new addition to my repertoire! 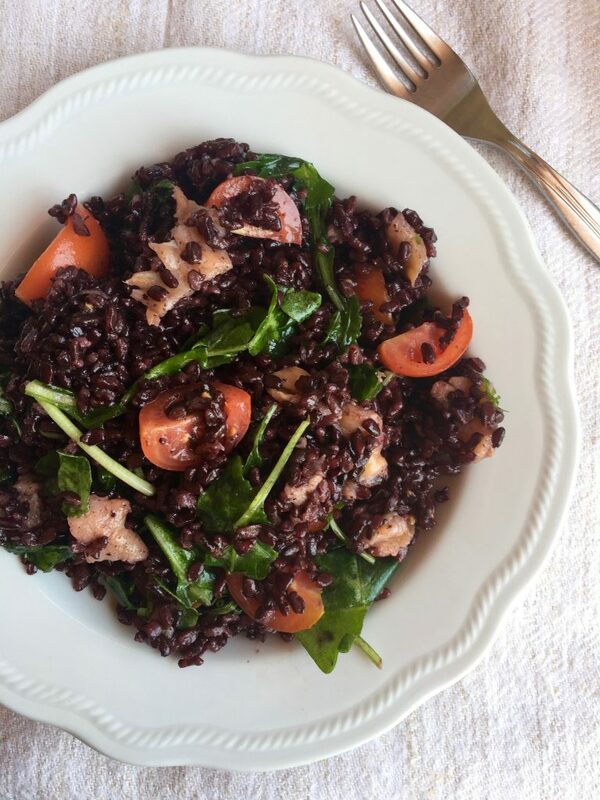 You’d think that the best part of this salad would be that it is so easy to prepare – albeit a bit time-consuming if you do choose to experiment with black rice. Even better, it tastes even more delicious the longer the flavours have to sit and mingle. That means you can double the recipe and enjoy leftovers for days! 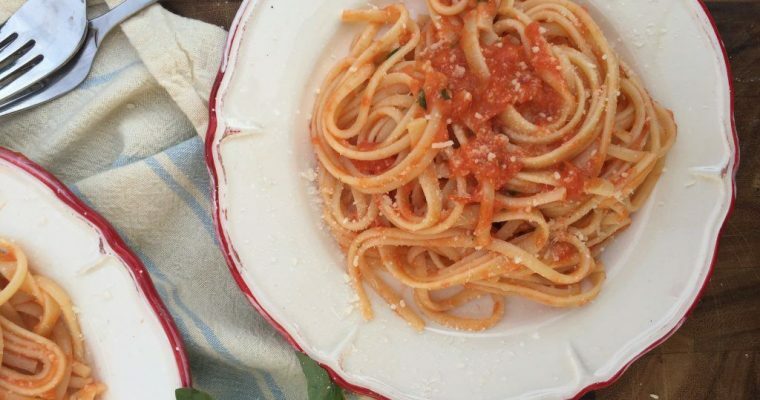 My one suggestion would be to add the cherry tomatoes right before you serve the leftovers so they don’t create too much excess liquid in the salad, and top off the salad with some more fresh arugula for a crunchy bite. 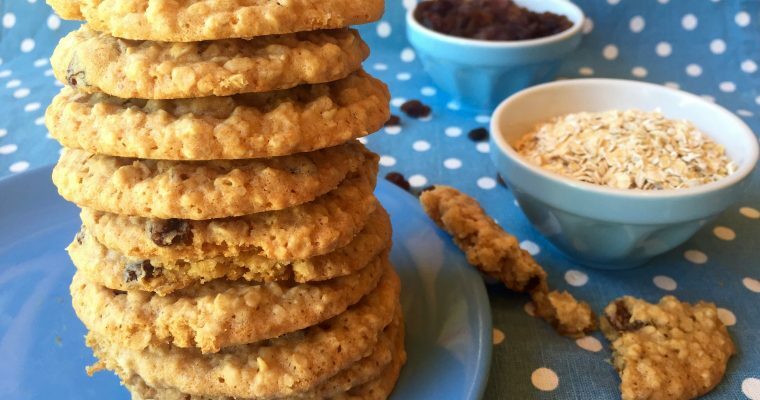 If you try this recipe (and love it!) be sure to snap a pic and tag me on Instagram with #bitesforfoodies so I can see your creation! Prepare the rice according to package instructions. Once cooked, drain and set aside in a large bowl to cool. In the meantime, cut the cherry tomatoes and smoked salmon and set aside. In a small bowl whisk the olive oil and lemon with some salt and pepper to taste. Combine all of the ingredients in a large serving bowl. Serve warm immediately, if desired, or store in the fridge to cool for about a hour. If you prefer a crunchy texture from the arugula add them just before serving. That looks so good. We are trying to incorporate more higher protein into our salads. Salmon is so high in protein, I LOVE black rice, great for fatigue. I have not tried that brand of black rice. I didn’t even know that black rice was great for fatigue! This looks delicious! I am never quite sure how to make salmon or what to ‘do with it’ but this looks like something i could do. I bet the entire family would love it! I love, love, love salmon and so does my husband and each of our kids. I have never paired arugula with salmon but I bet it is amazing. Arugula is my favorite salad choice. Love that you incorporated the black rice. Delish! I think you’ll love it! Salmon tends to have a sweet flavour, and so it pairs really well with bitter arugula, not to mention the textures! Now this looks delicious but, I too have never heard of Black rice before! I would love to try this out and prepare it for my husband since he love rice so much. Something about smoke salmon, I can eat it everyday! I’ve never heard of black or Venus rice but would love to try a different rice other than white. This salad sounds so fancy, yet, I would eat it in a heartbeat! I’ll have to try it! I have never tried this type of rice before. I think i need to now that I see a great recipe like this. I love finding creative salads for my lunches. A great way to stay on track with my food. I have never tried fish in a salad, but this looks and sounds delicious. I know my husband would love it. I might have to try this recipe. Salmon is one of those ingredients that can be eaten hot or cold, and is always delicious! I absolutely love smoked salmon just like that. I think it looks so good with what you have paired the salmon with too. I am enjoying all of the colors in it. I have never tried black rice before, but I would love to since I enjoy wild rice. This smoked salmon rice salad recipe looks delicious. It would be great for a light dinner on the patio. I actually think wild rice would be a great substitution in this recipe! Join us on our health journey! Receive inspiring posts and clean eating recipes delivered to your inbox weekly. Copyright © Bites for Foodies. All Rights Reserved. Baked from Windsor, CANADA. Become a part of our family. All the recipes delivered straight to your inbox.